This week's featured Louie Look is Bea in a graphic print Adidas shirt. Bea completes the look with black leggings and a jacket tied around the waist for a casual, sporty style. Louis is well-known for wearing Adidas. He's often been spotted out on the town wearing the brand. 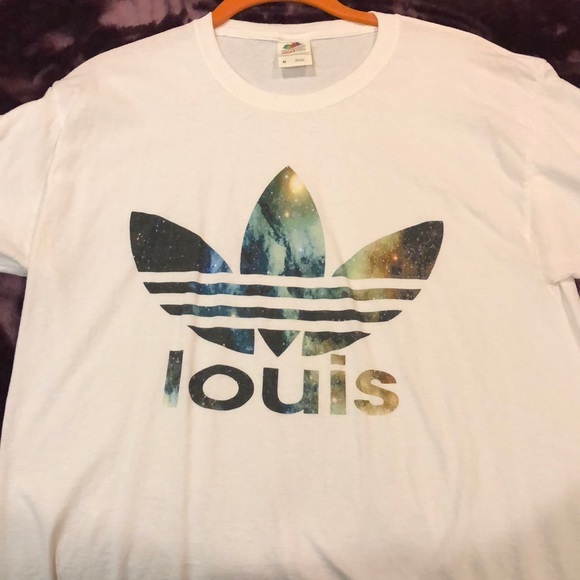 Someone even made a Louis/Adidas inspired logo for shirts. Louis has been in the studio during his down time from X Factor and one of the fans he met posted on Twitter that Louis said the album would probably not be out in 2018, but that at least one song would be released this year. Louis has so far released Just Hold On with Steve Aoki, Back to You with Bebe Rexha, Just Like You, and Miss You. He's also teased a few other singles that are possibly from his debut album.